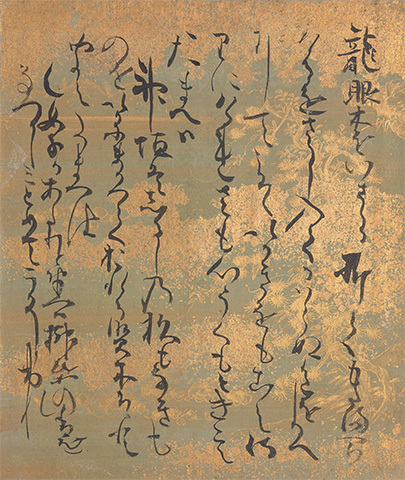 In conjunction with a Yale University Art Gallery rotation featuring the Beinecke Rare Book and Manuscript Library’s Tekagamijō calligraphy album and related works, an international group of scholars will gather for a series of roundtable discussions about tekagami albums, anthologies and albums as assemblages of dispersed materials, and the culture of appreciation and collecting of calligraphy and related works of art in 16th and 17th century Japan. Special focus will be given to the section of the Tōdaijigire—Minamoto no Toshiyori’s 1120 version of Minamoto no Tamenori’s 10th-century Sanbō ekotoba—within the Tekagamijō and additional leaves on loan from other collections and on view in the concurrent Yale University Gallery rotation. The rotation, entitled “Tekagamijō: A Japanese Calligraphy Album in Context” opens February 26, 2019 and includes the Metropolitan Museum of Art’s Mokagami album, Wakan rōeishū scrolls from the Harvard Museums, a unique 19th-century harimaze screen and other works from Yale, the Met, Harvard Museums and the Museum of Fine Arts, Boston. Workshop roundtable speakers will include Alessandro Bianchi, Ethan Bushelle, Claire-Akiko Brisset, John Carpenter, Funami Kazuya, Komine Kazuaki, Kuboki Hideo, Tomoko Sakomura, Ivo Smits, Sasaki Takahiro, Unno Keisuke, Lisa Fagin Davis (Medieval Academy of America), and Yale graduate students Nina Farizova, Mary Gilstad and Loren Waller. The workshop is sponsored by the Council on East Asian Studies and the 320Y Humanities Initiative at Yale University. Due to space limitations, registration will be required but there will be no fees for attendance. If you are interested in registering for this workshop, please email your full name and affiliation to eastasian.studies@yale.edu(link sends e-mail) by February 28th, 2019. For further information please contact Edward Kamens (edward.kamens@yale.edu(link sends e-mail)), workshop organizer, or eastasian.studies@yale.edu(link sends e-mail), Council on East Asian Studies staff.